Gender and Political Culture in Early Modern Europe investigates the gendered nature of political culture across early modern Europe by exploring the relationship between gender, power, and political authority and influence. This collection offers a rethinking of what constituted ‘politics’ and a reconsideration of how men and women operated as part of political culture. It demonstrates how underlying structures could enable or constrain political action, and how political power and influence could be exercised through social and cultural practices. The book is divided into four parts - diplomacy, gifts and the politics of exchange; socio-economic structures; gendered politics at court; and voting and political representations – each of which looks at a series of interrelated themes exploring the ways in which political culture is inflected by questions of gender. 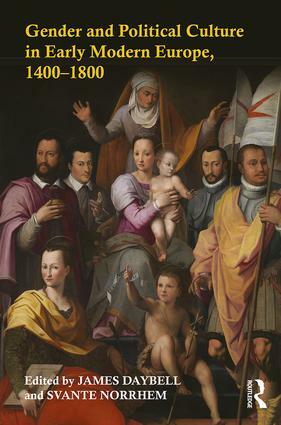 In addition to examples drawn from across Europe, including Austria, the Dutch Republic, the Italian States and Scandinavia, the volume also takes a transnational comparative approach, crossing national borders, while the concluding chapter, by Merry Wiesner-Hanks, offers a global perspective on the field and encourages comparative analysis both chronologically and geographically. As the first collection to draw together early modern gender and political culture, this book is the perfect starting point for students exploring this fascinating topic. "Daybell and Norrhem have provided a set of studies that are at once wide-ranging, and tightly connected by the issues of women’s often-overlooked roles in the exercise of power. This will be a valuable volume for undergraduates, graduates, and scholars alike, addressing issues of archives, material culture, the varieties of "soft" power, and global comparisons, which in total builds a compelling case for the centrality of gender and women’s roles in ruling." James Daybell is Professor of Early Modern British History at Plymouth University. His previous publications include The Material Letter in Early Modern England: manuscript letters and the culture and practices of letter-writing, 1512–1635 (2012) and (as editor) Women and Politics in Early Modern England, 1450–1700 (2004). Svante Norrhem is Associate Professor of History at Lund University. His previous publications include Flattering alliances: Scandinavia, diplomacy and the Austrian–French balance of power, 1648–1740 (with Peter Lindström).